The Treat mouse is an Event Mouse found during the annual Halloween event. As a master trick-or-treater, his little mouse never goes hungry. In fact, it spends much of its time rooting through its giant pillowcase of cheese, searching for the flavors that it likes before offering the rest to friends and relatives. Hunters everywhere have wondered: how does it get so much cheese with only a limited number of locations to visit? Well, cuteness is one factor, but changing costumes every two hours doesn't hurt either. Information on how to locate and capture the Treat Mouse can be found on the current Halloween location page. Attraction: Complete the Treat Terrible Nightmare stage. Attraction: Complete the Treat Pumpkin Patch stage. 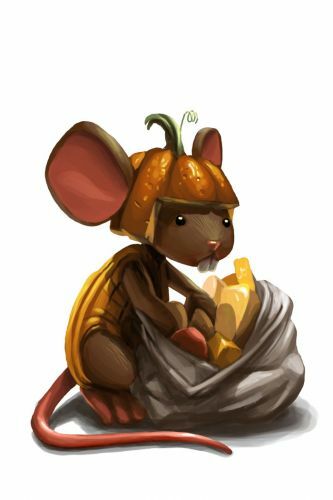 20 October 2010: The Treat Mouse was introduced with the Halloween Trick AND Treat event. When the Treat Mouse was released in 2010, it was only weak against Arcane, Forgotten, Physical and Shadow type traps. When the Treat Mouse was released in 2011, Draconic, Hydro and Tactical type weapons became effective against it. This page was last edited on 17 January 2017, at 03:38.